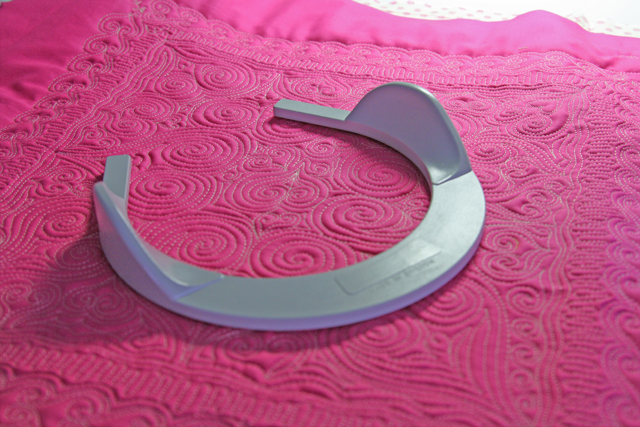 There are only two products that I really love for free motion quilting: The Supreme Slider (read about that HERE) and Viking Husqvarna’s Free Motion Guide Grip. Viking’s Guide Grip is larger than other hoops and because it is not a full circle hoop, it is easier to move during stitching. 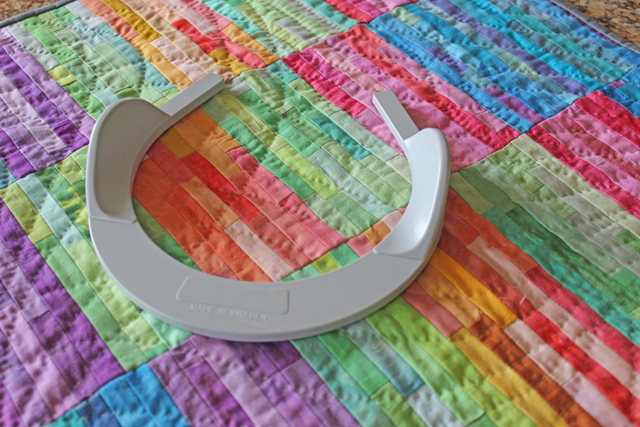 The curved handles are very comfortable for my hands–(allowing my hand muscles to relax) and the two rubber strips on the bottom of the guide hold the quilt beautifully—No need for hot and sticky little white gloves! While this post may sound like a commercial–I am not affiliated with Viking in any way…just thought I’d pass along one of my favorite free motion quilting products–My Secret Weapon! Don’t forget to visit the Tabs above, including the Quilts/Tutorials and the Bookshelf…I have been updating them…lots of news you can use! I really like the Kwik Klip, but I’ve used a knitting needle or a spoon as well. I will definitely give that a try. Thanks for sharing that tip! Does the shelf liner look like a soft mesh? Lori, is it only possible to use the hoop when you’re working on a central motif like an umbrella, or is there a way to adjust it when sewing lines, such as longer lines of Greek keys? 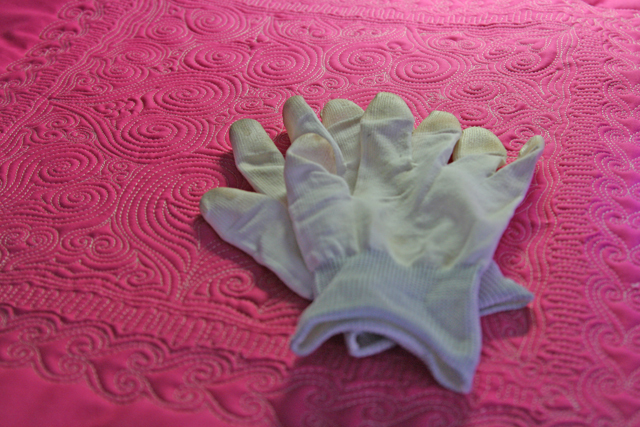 And if you haven’t tried them, I’d highly recommend the Fons and Porter FMQ gloves. They are breathable and they don’t have to be a snug fit to work well. Not only that, they’re really inexpensive ($5). That’s a great question. You can move the hoop along as you move. (Though you do have to stop to move it). It will work for any motif smaller than the hoop. A Grecian key is a series of small motifs. After sewing a few I just stop and move the hoop along. Just like you would stop and move your hands along. Does that make sense? This is one of the many reasons I bought a long arm. I’d love to see a video showing how you quilt with this product moving along the quilt surface. I am not set up to do videos at this time. But I am working on it! I do videos from my iPhone…and it’s quite easy. You need a iPhone adapter & a tripod, which can be purchased at Amazon for less than $35. ALL of my videos were / are made with my iPhone 4 ….it does a great job ! Jacqueline–Love you blog and your videos! Thank you so much for the information. Do you use any software for the videos? How did you add music? I’ll add a few more photos next week. 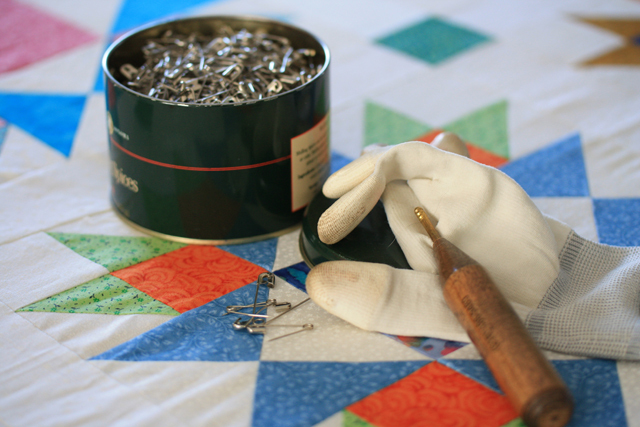 I started using myViking hoop when I tried quilting a large flannel quilt. It made It so much easier. I don’t think many people know about this hoop, but I love it! This seems like a great tool. I need all the help I can get…just ordered it. Thanks. Please let me know what you think of it. I’m curious to know if anyone else likes it as much as I do. I’ve been looking at the very expensive Martelli hoops. Would love to know the size of this one – as the price is much more affordable! I just looked up the Martelli hoops–I had never heard of them before. The Husqvarna hoop is 6-1/2 inches wide-smaller than the Martelli hoops. However, I have used full circle hoops before and I don’t like them nearly as well as this open hoop. I found I got “stuck” in the hoops. The open hoop (Husqvarna) is easier to move. Also the larger size can be a disadvantage when stitching a small quilt and when you are on the edges of your quilt. 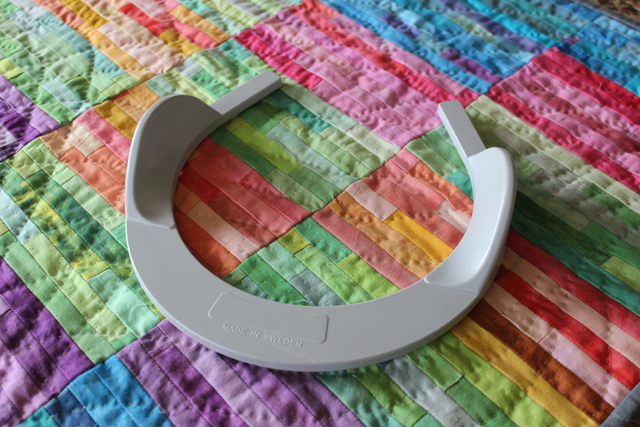 If the hoop hands off the quilt it sticks–in other words it is unusable…I would definitely consider the Husqvarna hoop. (PS…I am NOT affiliated with them in any manner–this is an unbiased opinion) Please let me know what you do and how it works out for you. I would be interested to pass the info onto other readers. The Bernina comes with a darning foot that works quite well for FMQ. I purchased the offset foot because it provides better visibility. I’m learning free motion and I were quite useful. Your work is amazing! Congratulations! And thanks for sharing your experience and knowledge! I have been researching different types of hoops for free motion quilting, I am not a fan of the gloves. I have a halo but am not convinced that there isn’t something better out there. I have seen the gypsy quilter hoops and I like that they are square but I haven’t found any one who has actually used them. I would love to hear your opinion of them. Excuse my mistakes, I use a translator to read and communicate. Until I read this, I didn’t even realize I had one! LOL. When I bought my new Pfaff, the machine came with a kit that included an extension table and this beauty. I guess I’ll have to figure out how to use it. I must admit I’m tired of the on and off glove-wearing. Lori, I love your web page and read all I can. I just now found this about the husqavarna hoop. Do you still use it? Love all your tutorials!!!!! Yes. I really like it especially for very small work.